The TextBox control allows you to set various properties to change the font used to display its text. If you want to format only a subset of the text, or format text items separately, you need to use the RichTextBox control. The RichTextBox control can only have one child element, which must be a FlowDocument. The contained document is referenced by the Document property, which is the RichTextBox’s content property. 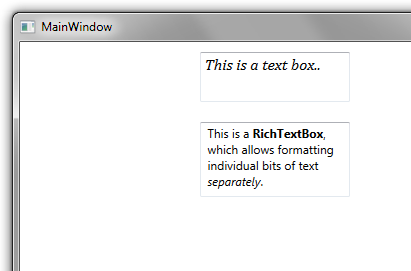 Here’s a simple example that compares a TextBox to a RichTextBox. <TextBox Text="This is a text box.." FontStyle="Italic" FontFamily="Cambria" FontSize="16"
individual bits of text <Italic>separately</Italic>.